Despite heightened awareness about the importance of veterinary dental care, dental disease continues to be the most common ailment in our pets. According to the American Veterinary Dental Society, dental disease is the number one health issue affecting 80% of dogs and 70% of cats over the age of three. This problem does not just affect the teeth but can have a negative impact on the rest of the body including the heart and kidneys. Your pet’s dental care begins as puppies and kittens. We will examine your puppy or kitten for missing teeth, duplicate teeth, or any abnormal oral anatomy. As your pet ages, it is very important to have his or her mouth checked frequently for problems. These problems can include: bad breath, loose teeth or teeth that are discolored or covered with tartar, diseased gums, foreign objects in the mouth, oral tumors, or jaw abnormalities. 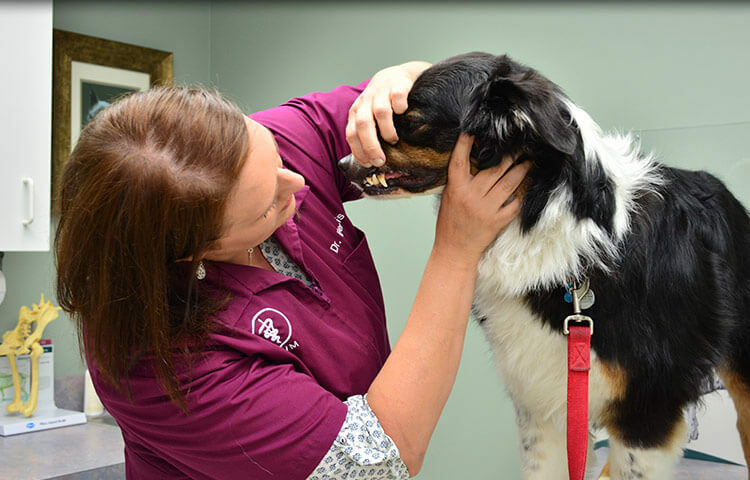 If your pet has dental disease, a complete dental cleaning is required. This involves an evaluation of the oral cavity and cleaning under general anesthesia. During the cleaning, we will remove tartar from not only the surface of the teeth but from underneath the gumline where the majority of bacteria and tartar are found. The areas between the gumline and the tooth are inspected for deep pockets. 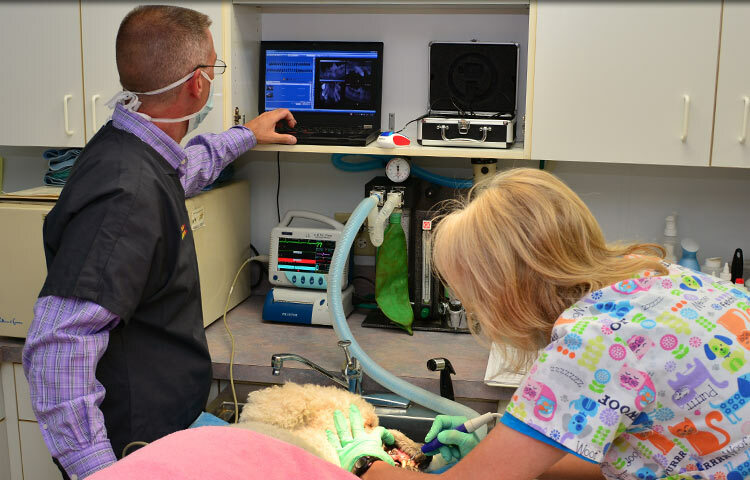 If abnormalities are found, dental radiographs will be performed to help determine the extent of dental disease and the need for tooth extractions. After the teeth are cleaned and other dental work is performed, they are polished to smooth the rough surfaces created by the cleaning. Without polishing, these irregular surfaces allow bacteria and plaque to adhere more easily and facilitate the recurrence of dental disease. Even though most people can tolerate and sit through a thorough dental cleaning, pets cannot. 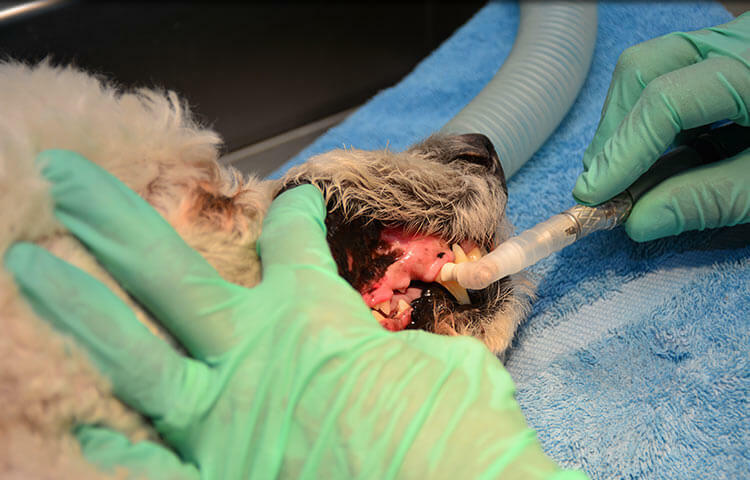 The only way to perform a complete dental cleaning in pets is by using general anesthesia. How do you keep your pets teeth clean? Once your pets teeth are clean, routine dental care will maintain oral health and minimize the need for professional dental cleanings. Pets should ideally have their teeth brushed every day. Realistically, brushing our pet’s teeth every day may not be possible, so do the best you can. Try to brush at least once weekly. While nothings beats daily brushing, other products can help reduce the bacteria and plaque that lead to tartar formation. These products include dental diets and dental chews. Be consistent and remember that early detection and diagnosis are the best defense against dental disease.